Laughter is just about the best remedy for a humdrum sort of day. 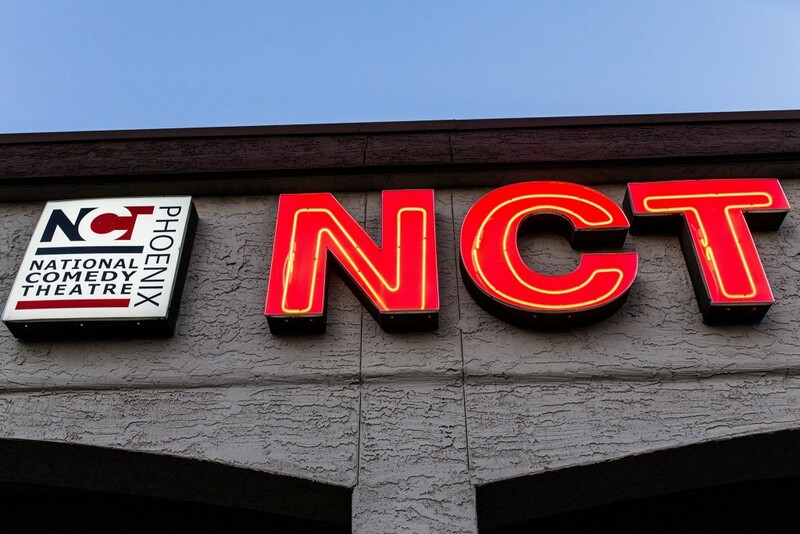 The National Comedy Theatre (NCT) in Phoenix has the most unique way of making you giggle, snicker, and belly laugh. NCT’s comedy show isn’t written or rehearsed, each skit is spontaneously created on the spot. No show is ever the same. NCT also strives to keep each show family friendly and enjoyable for all ages. Basically, there are two teams preforming and competing to be the most hilarious team. The show is hosted by a referee, it is the ref’s job to give out points and call fouls. Every performance is audience interactive. Anyone in the audience can shout out suggestions and challenge the performers to act something out. No one knows what will be acted out until random ideas come from the audience. Comedians will perform a series of games and scenes all based on audience ideas. Performers will often invite people from the crowd to come up and be interviewed. These special guest will sometime act out skits along side comedians. Because everything is improvised an inappropriate word may slip out from performers or crowd. As punishment for inappropriateness the show will pause for a moment and the ref will place a brown paper bag over the offenders head. Even a member of the audience may end up with a bag on their head. Uncensored shows are also available for adults 18 and up. Near the end of the show the audience may also vote to declare which team of comedians is the funniest. NCT holds about 100 people for each show. The stage in right up close to the crowed which helps keep the performers and audience members connected and spreads the energy. NCT also provides and teaches improv comedy classes and camps. These classes are fun way to sharpen wits and practice stage presents. Participants will learn professional comedy techniques from talented instructors. Classes are keep small so students may have the most one on one time with the instructor. Improv camps for kids and teens are also available to learn the art. NCT’s Improv comedy classes and camps are an excellent way to help you entertain your friends and family or help you reach your goals. Come see the show! NCT is performing every Friday and Saturday night! You may attend two NCT shows for free if you have Pogo Pass membership. A Pogo Pass is an economical solution to visit and participate in many interesting places. For a one time fee you can visit more places more often. Currently a Pogo Pass is 60% off with the promo code!